You can turn these geese loose in your strawberries, corn, or cotton and let them do the weeding. They leave your crop and eat the weeds! Our choice as to what geese are used to fill these orders (may be cross breeds). 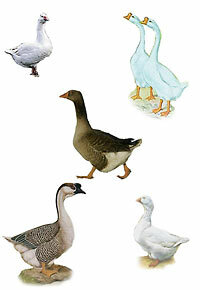 Which breeds of geese are best for weeders in the garden? All goslings do well as "weeders". Actually, the geese are looking to eat the new, young tender plants. They really do not know the difference between plants and weeds. So, make sure that the garden or flower bed is well established before you let the geese in to weed. Can you raise chickens and weeder geese together? Can you start them when babies? We recommend to keep the geese separate from your chicks. Geese can be very messy and will get the water dirty which is not good for your chicks. Also there is a very big size difference between them...your geese could smash your chicks. They should be fed different feed as well. Chick starter for your chicks and waterfowl feed for the geese. When are these geese generally available for order? Springtime? How old are the goslings when shipped? Goslings are less than a day old when shipped. Generally we have them to ship from March - June.